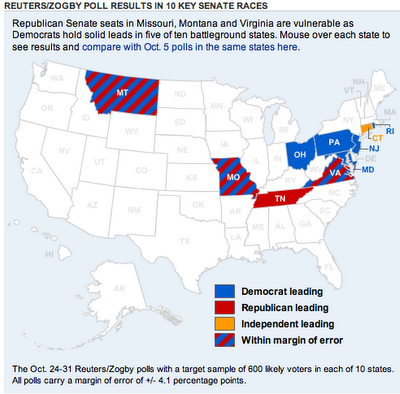 Democrats must gain six seats in Tuesday's election to win U.S. Senate control, and they lead in six of the seven most vulnerable Republican-held states, according to Reuters/Zogby polls released on Thursday. Democrats lead Republican incumbents in Pennsylvania, Ohio, Missouri, Montana, Virginia and Rhode Island, but only the Rhode Island and Pennsylvania races are outside the poll's margin of error of plus or minus 4 percentage points. Zogby's latest poll provides further confirmation that Missouri and Virginia have been trending in the right direction. As for the AZ race, our sources tell us that Republican Jon Kyl continues to hold a mid-to-high-single digit lead but Dems are enthused about their chances because Democrat Jim Pederson is apparently doing better in early voting than expected.